A dog is happy when he knows where home base is. a pet crate, a designated corner, a closet with a pet door or even a laundry or mud room with a gate will define his space and keep him out of trouble… and off the couch!… while you’re out of the house. “A dog is happy when he knows where home base is. A pet crate, a designated corner, a closet with a pet door or even a laundry or mud room with a gate will define his space and keep him out of trouble… and off the couch!… while you’re out of the house. Pet doors are liberating for both dogs and owners, and thru-wall doors are available for homes with glass doors. Some are even keyed to pets’ collars to keep out unwelcome visitors. 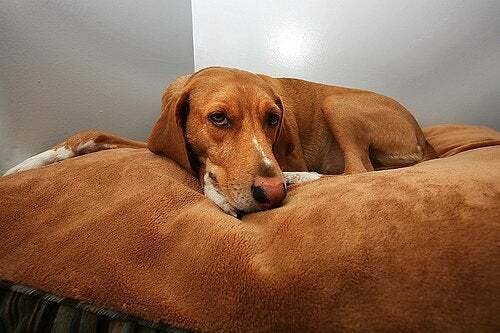 A good dog bed is actually not just a luxury. While it keeps your pet off the floor and away from drafts, it also reinforces his place in your house. Keep your dog safe by cleaning up household spills right away, especially in the garage or on the driveway. Some antifreeze can actually taste sweet to dogs, but ingesting even a little is fatal. Other highly toxic household products dogs have been known to get into include rat poison, mothballs, fabric softener sheets–and believe it or not–pennies. Keep dangers out of reach to keep your best friend safe at home.